This A. Rudin No. 2634 Two-Piece Sectional is no longer available. 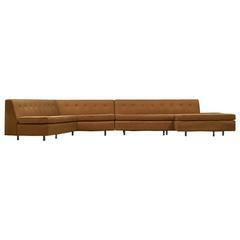 Design Plus Gallery presents sectional No.2634 from A.Rudin Company. Crafted in the US of the finest materials using skilled workmanship, this sectional and ottoman has meticulous detailing and luxurious comfort. The softened line highlights the warm broad stripes and creates a sense of ease for transitional or contemporary setting. Measures: 1 piece 72 x 39 x 32 2 piece 72 x 36 x 32. Drop in 3-Piece Sectional by Bensen Inc.
Two-piece sectional by Harvey Probber USA, 1960s Measures: 184 W x 84 D x 28.5 H in Newly upholstered, wood frame. Large 2 piece sectional sofa by Harvey Probber. 13 ft at it's widest. Both pieces labeled. Email for a detailed schematic of dimensions and geometry. 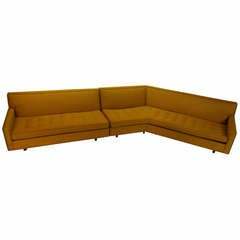 Rare three-piece sectional sofa by Harvey Probber with tall legs. This sofa has the original upholstery but is waiting for your new fabric.